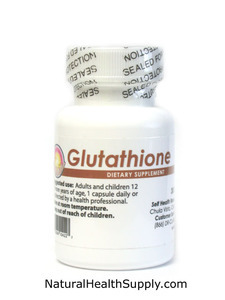 L-Glutathione is an amino acid naturally produced by the body from its three constituent amino acids: glycine, glutamate and cysteine. It can be found within each healthy cell. It is the body's most important anti-oxidant, because it is able to neutralize free radicals from within the cells. Each of the 60 vegetarian capsules of Glutathione contains 500 mg of L-Glutathione, guaranteed pure and potent from the Self Health Resource Center. No binders, no coatings, no dye. Suggested Use: Adults and children 12 or more years of age, 1 capsule daily or as directed by a health professional.